The saga of the world’s last standing Blockbuster Video stores has captured the imagination of the internet during the past year, with the final Alaskan holdout forced to shutter despite the efforts of Russell Crowe’s leather jockstrap. Now, the location in Bend, Oregon has gone full Highlander, standing as the lone outpost of the once-mighty chain. What most of the stories forget to mention is that Bend isn't some far-flung rural town that exists in a technological vacuum. In fact, Bend is one of the fastest-growing cities in the Pacific Northwest, and one of the best beer towns in America. And so it’s come to pass that Oregonians’ love of antiquated technology, beer, and nostalgic irony have finally come together in one bottle, like some sort of direct-to-VHS movie featuring Dolph Lundgren, Michael Dudikoff, and Cynthia Rothrock. 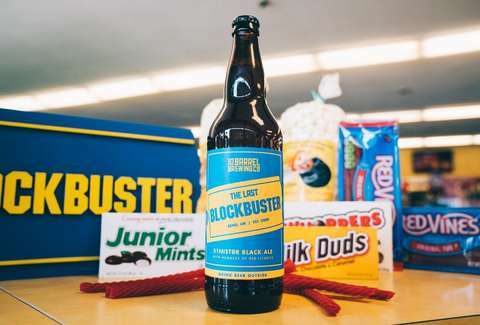 Bend-headquartered (and now nationally available) brewery 10 Barrel will release The Last Blockbuster, a 22-ounce bottle of dark ale commemorating this lost monument to a bygone era. The beer will be released September 21. It, probably like Blockbuster, will only be available for a limited time. According to a statement released by the brewery, the beer -- which also sounds like the title of an extremely meta action comedy in the vein of Last Action Hero -- has a light body, smooth finish, and hints of nostalgia.” According to the label, there are “nuances of red licorice.” Presumably, it also has the ability to make anyone who drinks two immediately make regrettable “3 for $10” used DVD purchases, then wake up to the stunning realization that Steven Seagal still makes a shitload of movies in between trips to Russia. Because Oregon is Oregon, Blockbuster isn’t even the only video store with a special beer from an acclaimed local brewery. Iconic Portland video store (and recently named nonprofit) Movie Madness also has its own beer, courtesy of Ex Novo. No word yet on whether the option to drink beer while searching one of the world’s biggest movie collections has had a positive effect on rentals from the JCVD section. Meanwhile, patrons of the 700 or so remaining Family Videos remain content to simply pour vodka into a 20-ounce bottle of soda and call it a night. Former Oregonian Andy Kryza is a one-time video store clerk who has seen the lights of this very Blockbuster. He continues his lifelong quest to find the perfect beer to pair with Bloodsport (it’s probably a Kriek). Follow him to well-deserved wedgies @apkryza.